Taking a picture of our dim sum dishes before digging in! 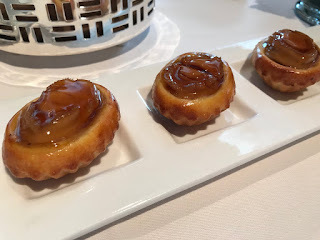 Over a year ago YTSL and I made a trip to Lung King Heen and we were in heaven biting into the barbecue pork buns with char siu and pine nuts. Still dreaming about them, we came back again with another friend to give us the excuse to order more food! We were given a late reservation of time of 2.15pm and we were worried there wouldn't be much food left, but in fact a few other diners trickled in after us. Even Chinese executive chef Chan Yan-tak made an appearance in the dining room. 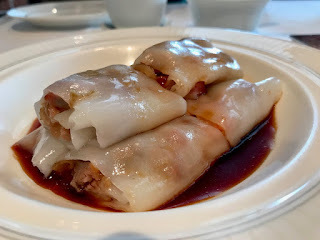 One of our favourite dim sum this time was the steamed rice rolls with char siu and preserved vegetables (HK$100). That's not a combination you find in other dim sum places and now I'm wondering why not! The preserved vegetables have a savoury taste and also help balance out the sweetness of the char siu. The crunchiness of the vegetables also adds a nice texture. The rice rolls were so thin and yet they didn't break when we picked them up. Amazing. 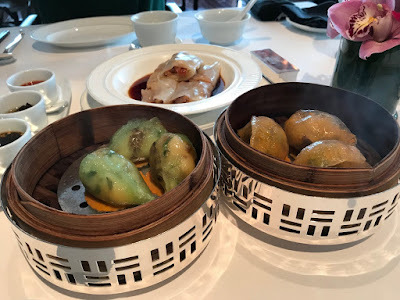 While I love har gao or steamed shrimp dumplings (HK$99) with bamboo shoots, I have to say these ones weren't particularly outstanding, boring in fact. Maybe it's because no MSG was added. I ordered steamed assorted mushroom dumplings with celery (HK$99) and this too was almost refreshing in a way, along with a bit of a crunch that was very delicate. The same could be said with the steamed scallop dumplings with vegetables and wild mushrooms (HK$99). The baked whole abalone puffs with diced chicken (HK$82 each) were YTSL's highlight. She liked the east-west taste as the pastry is very buttery, the abalone cooked perfectly. 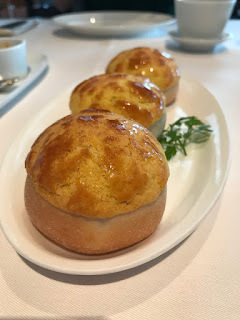 We also liked the baked beef puffs with mushrooms and preserved vegetables (HK$99). We eagerly anticipated having the baked barbecue pork buns with pine nuts (HK$99) and upon picking them up I was amazed at how thin the pastry was in holding the hot, sweet, gooey filling inside. When I bit into it, the familiar sweetness of the char siu was there, the fat taken out so it was all lean, but wait -- where were the pine nuts? Mid-way through eating the bun I finally tasted them, but I remembered last time there were many more pine nuts in the filling. Was it cutting costs? Pine nuts aren't cheap either. Nevertheless the pine nut taste lingered in my mouth.